Royal Highness is the delightfully ironic tale of a small, decadent German duchy and its invigoration by the intellect and values of an independent-minded American woman. Peopled with a range of characters from aristocrat to artisan, Royal Highness provides a microcosmic view of Europe before the Great War. Thomas Mann (1875-1955), winner of the Nobel Prize for Literature in 1929, wrote essays as well as some of the great novels of the twentieth century, including Buddenbrooks, The Magic Mountain, Death in Venice, Joseph and His Brothers, and Doctor Faustus. Russell A. Berman is the author of The Rise of the Modern German Novel. 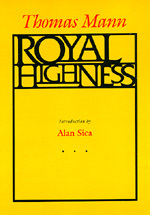 Alan Sica is the author of Weber, Irrationality, and Social Order.